When you are wine tasting (drinking heavily) in Napa, it's always good to stay fed in order to have something to soak up all that sweet alcohol. Of course, if you are going to be paying for tastings, you don't necessarily want to be be dropping a wad for food at every meal. It's best to find some affordable place that has some decent food and will fill you up heartily so you can get back onto the wine trail. In searching out places to eat I'm always drawn to barbecued meats and if I see smoke coming from a grill I'm gonna wanna stop and try. 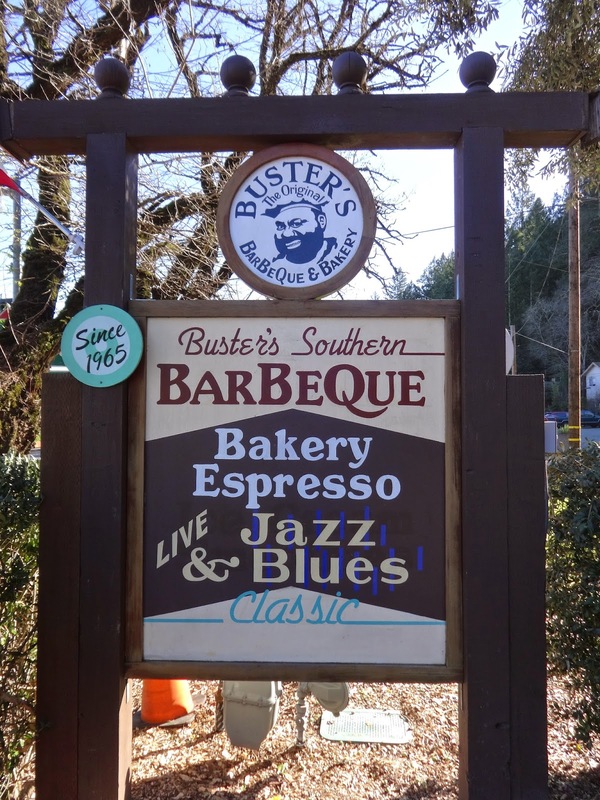 Such was the case with Buster's Southern Barbecue in Calistoga. It's a real side of the road kind of place but it looks to be popular during the lunch hour as cars are filling the parking lot. Plus they've got whole side of ribs cooking on the grill outside. Looked good, but won't be done to order in time for me. Still they have plenty of other meat choices to get and I'm feeling in a brisket mood today. It's the dinner plate with brisket, side of potato salad, baked beans, garlic toast and sauce on the side for $12. For an extra $2 I added in a cornbread muffin. You get a generous portion of smoked meat that is sliced thick, cooked to medium with slight pink. It's juicy, tender and cuts with a plastic fork. For me it just needed a little extra salt but otherwise it was very tasty. The sauce was kind of a tangy sweet thing which wasn't my taste exactly, but the meat stood on it's own. The beans were of the barbecue baked style and again on the sweet side for me, decent enough but nothing too special. The potato salad was just okay too. Could have used some kind of seasoning to flavor it up. Definitely needed salt and pepper. Weirdly, I did kind of like that loaf of garlic bread. It had a generous spread of garlic butter and was served freshly toasted. The cornbread muffin I liked but would have enjoyed more if it was served hot or at least warm. It was crumbly, corny and hit the right notes texture wise. I just kept thinking though how much better it could be warm with melted butter. Since this is a barbecue meat joint I'll say if you are in or near Calistoga it is worth stopping in for a quick bite. Though I would say skip the plates as the sides are just okay. Go straight for the sandwich which comes on the same kind of garlic bread and it's all about the meat here and the sandwich will definitely highlight that for you. Sandwiches run $10 and do come with one side, so you would get to try one anyway, thus you are on your own there. Meat choices include ribs, brisket, hot links, chicken and a sort of Mexican version of pulled pork that has green peppers in it. All the meat I saw looked good. When you are drinking lots of wine (or any alcohol) they say protein is a good thing to help fill you up and keep you from getting too drunk too quickly. Which is good since you have to drive from winery to winery. This makes Buster's a good place to start with or hit mid trip to meat up, fill up and power up so you can get back out there and wine up to your heart's delight.